Is It Time To Dismantle the Lecture Hall? In this debate, the question might not be so much about whether online education is effective, but whether it could be any worse than the existing model. When Anant Agarwal was in college, he would "follow the professor for the first five minutes" and then get lost and spend the next hour scrambling to keep up with note-taking. That's no way to run a learning model, said this professor of electrical engineering and computer science at MIT and CEO of edX, the storied MOOC site founded by Harvard and MIT. On the other hand, "Online education will not replace the great colleges." People learn from each other when they "work together, live together, sleep together," said Jonathan Cole, professor at Columbia University and author of the 2011 book The Great American University: Its Rise to Preeminence, Its Indispensable National Role, Why It Must Be Protected. Then again, contended Ben Nelson, the practice of paying a professor to teach just a few students each year is not exactly an economically viable model. Those who oppose the rise of massive open online courses are critiquing the current state, "not what the potential is," added this founder and CEO of Minerva Project, a university opening in fall 2014 where students will live in close proximity and take classes online. Of course, asserted Rebecca Schuman, MOOCs can be "great fun," but they're no replacement for college. This adjunct professor at the University of Missouri-St. Louis and a columnist for Slate and the Chronicle of Higher Education said she believes that "more clicks means less contact." So go the arguments for and against (and for and against) the idea of online learning walloping the tradition of face-to-face instruction. As higher education evolves, has the lecture hall model become obsolete? In a debate hosted by Intelligence Squared on the campus of Columbia University, two teams of academic experts squared off to settle that question. Agarwal and Nelson supported the motion that the world needs "more clicks and fewer bricks." Cole and Schuman spoke against the motion. The series in which this debate was featured is based on "the traditional Oxford-style debate format." A motion is put forward, with one side proposing it and the other side opposing it. Before the discussion begins, members of the audience use a clicker system to show their pre-debate opinions. Then each debater delivers a seven-minute opening statement and a moderator opens the debate up to questions from the audience. Finally, the debaters each have two minutes to summarize their arguments and the audience casts its votes again. The winner of the debate is not the side with the most votes but the side that has converted more of the audience to its position. Before the debate — titled, "More Clicks, Fewer Bricks: The Lecture Hall is Obsolete" — began, the audience was definitely on the side of tradition. Fifty-nine percent were against the motion; 18 percent were for the motion; and 23 percent were undecided. And the arguments were set forth. Agarwal shared the story of two students who took his edX course on circuits and electronics, thereby gaining access to resources they otherwise wouldn't have. One student, who came from a family of 14 in the Democratic Republic of the Congo, had to leave university to go to work after the death of his father. Ten years later MOOCs were enabling him to get back to his studies in order to "get a better job." The second, a 15-year-old student in Poland, did "really well" in Agarwal's course, applied to MIT and was accepted. He's now a sophomore. 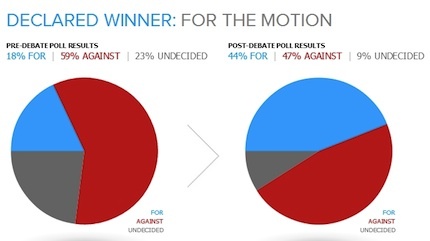 Distance education versus lecture: graph showing poll results before and after the debate. Even students who have access to one of the best faculties in the world — the instructors of MIT — want online learning, he insisted. Two out of three are now doing blended learning, only two years after the introduction of edX. "This is not about comparing the absolute best you can get in a particular kind of course against the online learning of yesteryear," Agarwal said. "I would like you to think about the average student around the world in terms of where universities should be, in terms of increasing access and improving the quality of education on campus." Cole countered that putting too much in an untested model could be a poor decision long-term. "One of the problems I have with all of this is that it seems to me there are many possibilities for technology and many ways in which technology can improve universities. But we don't know the answer — how do graduates of one form or another respond in terms of employment opportunities. We don't know very much about different learning styles. We have so little evidence, we are essentially casting our fate to the wind and saying, 'Look, this is a possible,' but it's not necessarily a fact." Bolstering Cole's argument against the motion, Schuman recounted an experience she'd had in a recent seminar class, which examined a line from a book the group had just read. She called on a student at random to ask what the line meant; he offered his opinion, and the discussion took off from there. "We went back and forth in the class, me back to him, other students to him, other students to me," she recalled. "This was a moment we created together in real time in the same room, with energy between people you could feel and that changed us all just a little bit. It's certainly true that in a thousand-person lecture, that kind of moment is few and far between. But I don't think the answer is to put that lecturer online in five minute chunks. And I don't think it's to get rid of the classroom together." But it was Nelson who perhaps best summarized the argument for the value of the online model. "One fact is what we actually know not about online education but about offline education — not at a community college, not at a state university, but at one of our most illustrious universities. Eric Mazur at Harvard wanted to know how much his students retained from his physics classes. He surveyed them two years after the end of the course. Their retention rate was 10 percent. The question isn't as much whether online education is effective, but that it can't possibly be any worse than the existing model." And now, he added, even when students are given a choice of attending lectures delivered by one the most renowned professors of their time or viewing it afterwards online in video form, most will choose the latter. That was what happened with Sebastian Thrun in testing his first MOOC, an experiment that eventually grew into Udacity. "He had a course of 200 students on artificial intelligence. He gave them an option: Schmooze with me in the lecture hall, or go on version 'zero-dot-one' of this terrible product and take the course online. Of the 200 students, 85 percent never came back to the lecture hall. Eighty-five percent decided to take the online course in the very first rudimentary version of online education." People pondering the fate of higher education, concluded Nelson, "don't need much more data than that to realize that the future of the university won't be without bricks, won't be all clicks, but will certainly be far more clicks than bricks." By the end of the debate, the number of people who agreed with Nelson and Agarwal grew from 18 percent to 44 percent. And the motion carried.